^ The CIA World Factbook reports that in the 2001 UK census 92.1% of the UK population were in the White ethnic group, and that 83.6% of this group are in the English ethnic group. The UK Office for National Statistics reports a total population in the UK census of 58,789,194. A quick calculation shows this is equivalent to 45,265,093 people in the English ethnic group. However, this number may not represent a self-defined ethnic group, these data do not take into account non-white people who would also identify as ethnically English. The number who described their ethnic group as English in the 2001 UK census has not been published by the en:Office for National Statistics. ^ (Ethnic origin) The 2006 New Zealand census reports 44,202 people (based on pre-assigned ethnic categories) stating they belong to the English ethnic group. The 1996 census used a different question to both the 1991 and the 2001 censuses, which had "a tendency for respondents to answer the 1996 question on the basis of ancestry (or descent) rather than 'ethnicity' (or cultural affiliation)" and reported 281,895 people with English origins; See also the figures for 'en:New Zealand European'. ^ "Nation", sense 1. The Oxford English Dictionary, 2nd edtn., 1989'. ^ a b Krishan Kumar, The Rise of English National Identity (Cambridge University Press, 1997), pp. 262-290. ^ Sarah Kane, Complete Plays (19**), p. 41. ^ a b Simpson, John; Weiner, Edmund (1989-03-30). The Oxford English Dictionary: second edition. Oxford: Clarendon Press. pp. English. ISBN 0198611862. http://www.oed.com. ^ Liberation of Ireland: Ireland on the Net Website. Retrieved 23 June 2006. ^ A History of Britain: The British Wars 1603-1776 by Simon Schama, BBC Worldwide. ISBN 0-563-53747-7. ^ EJP looks back on 350 years of history of Jews in the UK: European Jewish Press. Retrieved 21 July 2006. ^ More Britons applying for Irish passports by Owen Bowcott The Guardian, 13 September 2006. Retrieved 9 January 2006. ^ a b Black Presence, Asian and Black History in Britain, 1500-1850: UK government website. Retrieved 21 July 2006. ^ Fresh call for English Parliament BBC 24 October 2006. ^ Scottish Census Results Online Browser, accessed November 16, 2007. ^ Key Statistics Report, p. 10. ^ Country of Birth: Proportion Born in Wales Falling, National Statistics, 8 January, 2004. ^ Staff. Ethnic origins, 2006 counts, for Canada, provinces and territories - 20% sample data, Statistics Canada, 2006. Krishan Kumar (2003). 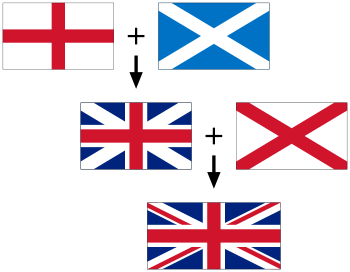 The Making of English National Identity. Cambridge University Press. ISBN 0521777364. Jeremy Paxman (1999). The English. Penguin Books Ltd. ISBN 0140267239. Watching the English - an anthropologist's look at the hidden rules of English behaviour.